Looking for a long chiffon prom dress with trendy embellishments that don't cost a fortune? This beautiful evening dress, under $200, has lots of glamorous details that are sure to impress at your formal event. Clusters of sparkling rhinestones on embroidered lace applique adorn the fitted illusion-sweetheart bodice. A lace high neckline wraps around to attach to the sheer-mesh back panels that frame the keyhole cut outs. The figure-flattering long a-line skirt flares away from the hips before flowing down to the floor in layers of silky chiffon. 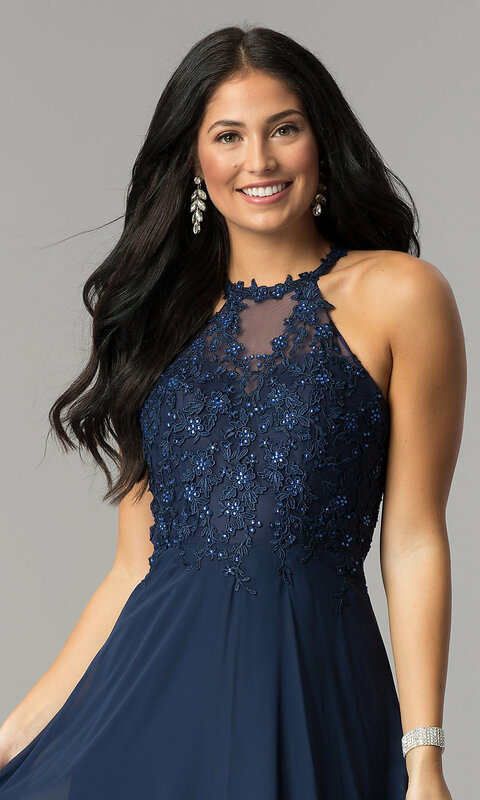 Available in misses and extended sizes, this long chiffon prom dress is sure to make an elegant impact at your formal celebration without emptying your bank account.